Caissons are drilled deep foundation elements typically reinforced with steel cages. 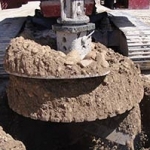 Caissons are constructed in place of conventional footings in fills and poorer materials to transfer loads to more competent soils or rock layers. 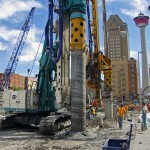 Caissons can be constructed using mud drilling, cased or open hole augering techniques. The HCM Group continues to invest in caisson equipment and build our alliances to allow us to complete large caisson projects. HCM has the ability to custom fabricate liners and augers in-house to meet unique project needs including large diameter monopole requirements. 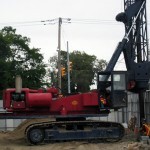 With the expertise of HCM, working in conjunction with RWH Engineering Inc. for on-site field assistance, we can deliver your caisson project on time and budget.